Pot roast is typically made by browning and then slowly simmering a cut of beef with a mix of vegetables and spices in liquid. The result tends to be high in calories in part because of the large serving sizes. Limiting yourself to the recommended 3-ounce serving of meat and filling up on vegetables can help you keep the calories in your meal under control. A 3-ounce serving of pot roast made from beef chuck from under the blade and trimmed to remove the fat has about 184 calories. Use beef shoulder, and the same-sized serving has 170 calories, and a 3-ounce size of pot roast made from beef chuck arm has about 180 calories. The grade of meat also makes a difference in the calories. Choose select beef chuck arm instead of choice, and you'll only consume 166 calories instead of 180. 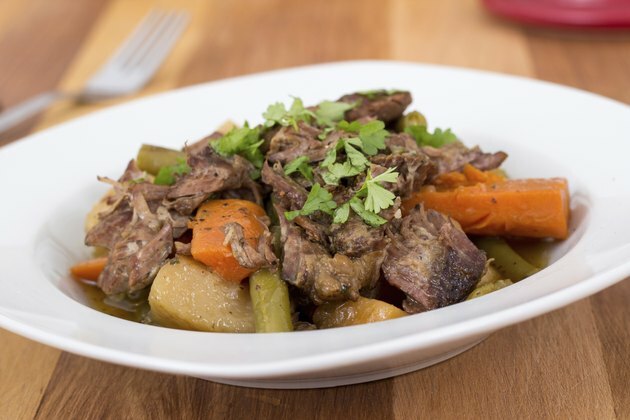 A serving of a pot roast recipe usually ranges from 1/2 pound to 3/4 pound of meat, along with anything up to about 3/4 cup of root vegetables, such as carrots, parsnips and rutabagas. Some recipes include chopped bacon as well as beef chuck or use alcohol instead of broth for the braising liquid. Both of these ingredients can increase the number of calories in the dish. The calories in each serving range from about 582 to about 817, depending on the ingredients used and the serving size.